All transactions are safe and secure with a reliable history in online purchasing behind each of our associates. Buy the Snoopy Christmas t-shirt to own Snoopy clothing and merchandise. Snoopy is such a good sport; he had taken to decorating his doghouse for the holiday and now he's playing after a hard day of work. He and his yellow friend Woodstock are having fun dashing through the snow on their sled. 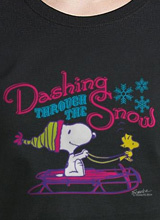 This Snoopy Woodstock t-shirt is sure to spread Christmas cheer. Start off the holiday season right with this Snoopy Christmas shirt and a touching Snoopy ornament or plush dog. In addition to the Snoopy Christmas tee above, browse the Snoopy Clothing Gallery for more apparel like men's and women's clothes, kids shirts or hoodies.